The Apparent and True Orbits of Alpha Centauri. The Apparent Orbit (thin ellipse) is the shape of the orbit as seen by the observer on Earth. The True Orbit is the shape of the orbit viewed perpendicular to the plane of the orbital motion. According to the radial velocity vs. time, the orbit is divided here into 80 points, and each step refers to a timestep of almost a year. 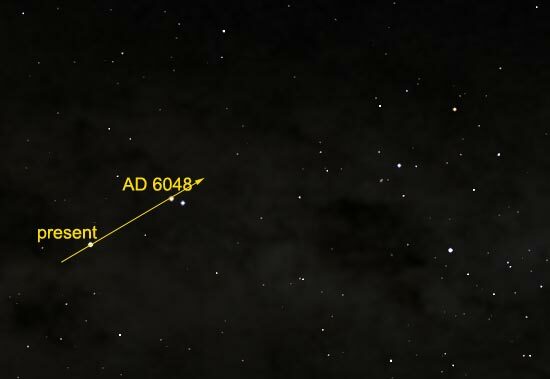 Alpha Centauri is the brightest star in the southern Centaurus constellation. It is the fourth brightest star in the night sky, with a magnitude of -0.01. It is visible in the Southern Hemisphere, and is too far south for most of the Northern Hemisphere to see. Alpha Centauri is a binary star system of two stars A & B. The distance between them is quite close. To the naked eye, the stars are too close for the eye to be able to see them as separate. Their orbit is about the distance of the giant planets from our Sun. There is a third star, Proxima Centauri (or Alpha Centauri C). This is usually considered separately, but in fact it is also gravitationally connected to the other two. 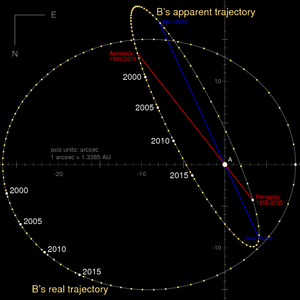 It is actually slightly closer to us, with a very much larger orbit around A and B. Viewed as a triple star system, Alpha Centauri is the closest to our own, being 4.2-4.4 light years (ly) away. It consists of two main stars, Alpha Centauri A and Alpha Centauri B (which form a binary star together) at a distance of 4.36 ly, and a dimmer red dwarf named Proxima Centauri at a distance of 4.22 ly. Both of the two main stars are rather similar to the Sun. The larger star, Alpha Centauri A, is the most similar to the Sun, but a little larger and brighter. The next closest star is Barnard's Star. The two bright stars at the lower right are Alpha (right) and Beta Centauri (left, above antenna). A line drawn through them points to the four bright stars of the Southern Cross, just to the right of the dome of La Silla Observatory. Compared to the Sun, Alpha Centauri A is of the same stellar type G2, while Alpha Centauri B is a K1-type star. Relative positions of Sun, Alpha Centauri AB and Proxima Centauri. Grey dot is projection of Proxima Centauri, located at the same distance as Alpha Centauri AB. 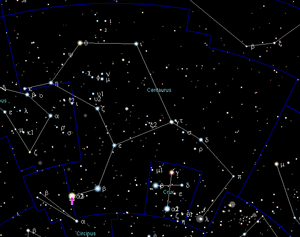 Stars closest to the Sun, including Alpha Centauri (25 April 2014). The Very Large Telescope and star system Alpha Centauri. Alpha Centauri Facts for Kids. Kiddle Encyclopedia.